STI Mud Trax ATV tires. Self cleaning lugs for good bite! Check this link for the best deals on these ATV mudding tires. World of ATVs answer: Thanks for the tip Zak. We are hearing a lot of good things about the STI MudTrax ATV tires. We don't know that they would be considered a serious ATV mud tire, but they seem to be gaining popularity as a good all purpose trail tire when you do have to ride through a lot of mud. The 25 inch diameter tire has a 3/4" lug depth which is what we consider a bare minimum for ATV mudding. But the 26 inch tire does have a 1 1/8 lug depth which should work well in all but the most extreme deep mud. We've heard from several riders that the MudTrax ATV tires are the best all around tires they've tried. The V tread pattern works well enough in most conditions while providing a smooth ride on hard pack. 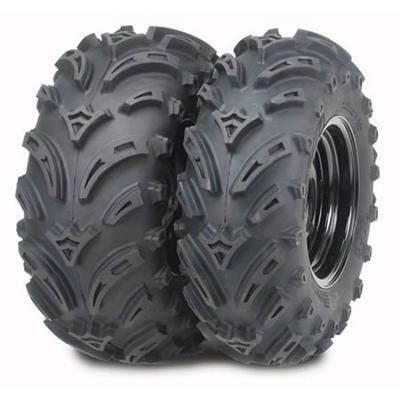 When you add the medium depth sidewall lugs, you end up with a very good ATV tire for a wide variety of riding areas. They come in 12 and 14 inch sizes, so they will fit those larger utility ATVS and UTVs. We even know some guys running them on 2wd Honda Rancher 420s with no problems, so they should really work well on larger 4wd ATV and UTVs. If you're in the market for a good all around ATV tire with mudding capability, you should check out the STI MudTrax tires. I got four 25 inch mud trax tires on my 2010 Artic cat 450 H1 and it runs really well with those tires...they run great on the trail, on hard pack surface and are good in the mud. Bought a set of these and they work great! Thanks for recommending them.